A common misconception among many folks is that hair loss is a problem that only affects men but the reality is that female hair loss is a lot more common than you might expect. Indeed, various studies have shown that when it comes to thinning hair problems, both men and women are equally affected with the actual pattern of loss being the only difference between female and male baldness. While the male hairline will gradually recede back until the man gives the appearance of being bald, female hair loss tends to be subtler with hair loss equally distributed over the whole scalp. Only when the hair becomes thinner does the woman�s scalp become more noticeable. As to the cause of female pattern baldness, several factors come into play. While male baldness is typically caused by genetic factors, hairloss in women usually comes about for different reasons although it can often be hereditary in many women as well. As well as thinning hair being genetically related, other causes for major hair loss include such things as hormones, medications, pregnancy, stress or over usage of strong hair chemicals. However, the good news for women is that any hair loss related to these factors can be reversed, as the hair will eventually grow back once the situation has been resolved. Nevertheless, there are many instances where the only solution to the problem is medical intervention. 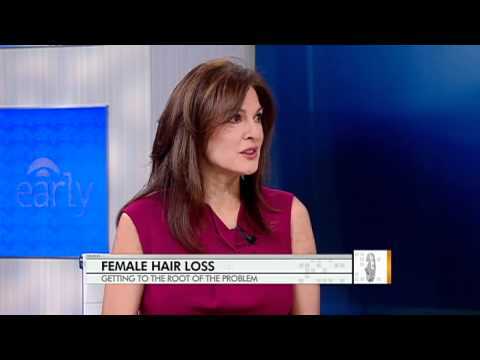 Hair restoration surgery is one of the options for female hair loss, once it becomes unmanageable. On the other hand, if the problem has not yet reached that stage, thinning hair loss solutions can be just as effective. Propecia and Rogaine are two of the more common restoration solutions and are the only drugs certified and approved by the FDA. Both products are effective at what they are designed to do although only Rogaine is recommended for women who suffer from hair loss. Alternative hair restoration systems include hair extensions, wigs and hair weaves. While none of these are permanent solutions, the treatments will provide relief for women, albeit temporary. Nutrition can play a big part in reducing the risk of hair loss and to that end, taking iron and vitamin C supplements can help. Hair thinning problems may also be helped with the use of hair loss shampoos, which are formulated to help remove all those unwanted particles on the scalp and in the follicles of the hair. Nowadays, female hair loss continues to affect many women, although with the latest solutions that deal with this issue, maintaining healthy hair should not be much of a concern at all.